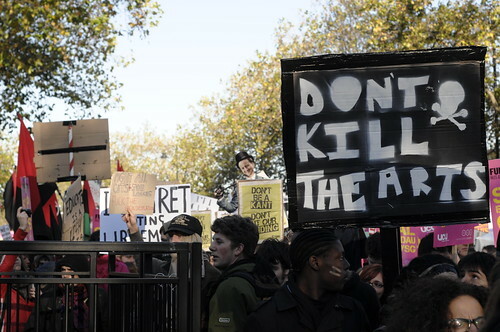 Protest to Education Cuts in the UK, 2010. CC image courtesy of Selena Sheridan on Flickr. Arts advocates in the US of A may be used to hearing stories of strong government support for the arts abroad and wondering why we don’t have that kind of support—especially as Kansas loses their arts commission and the National Endowment for the Arts continues to be politically contentious despite the miniscule amount of federal funding it receives. But the arts are suffering abroad as well, as economies shrink and everyone is looking for places to scrimp. In the UK, Mark Brown, The Guardian’s arts columnist, is recording the effects of arts cuts in his Culture Cuts blog. The blog chronicles the impact of cuts to the Arts Council (the UK's version of the NEA) as well as the effects of regional and local arts cuts. It’s interesting to see the many parallels that are playing out across the pond as organizations struggle with funding cuts from all sides. “We are not saying that the Arts are more important than other sectors. We just want to make sure that the effects of these cuts are properly recorded and publicised,” according to the “Who We Are” section of the website. “Our aim is to show what we could be losing forever, on a day by day basis.” The site, which is run by a group of eight unions directly affected by arts cuts, also accepts submissions from organizations or individuals to be added to the database. Lost Arts - US Edition?